I just purchased this slot machine. Looks like everything is there. The door switch is broken, and I get ee 61 when I turn it on. Does anyone know what that error is? Also, what is the best place to buy one of those door switches? Thanks. Ok. I got the 61 to go away. I’m not sure how, but it’s gone.... It seems like it’s waiting for coins to be put in. It reads 2.0.0 at the win line, and 0 at the last in. Everything else is blank. Does that sound right? It looks like someone has jacked with the coin mechanism. I think something is missing, or broken. I have pics if that will help. Any help is appreciated. Thanks. I did replace the battery with with an Energizer 2032, and bypassed the door switch. Maybe one of those things got rid of the if the 61 error.... I don’t know for sure, just letting you know what I’ve done. Thanks. Thank you for the response. I’ll take some picture and post them. Is there anything specific you would like a picture of? 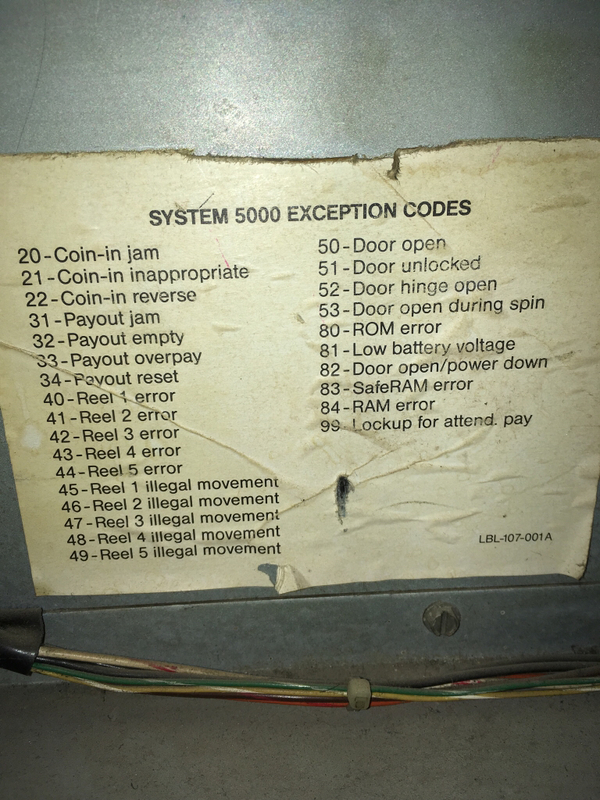 does your machine have a list if error codes inside the case?? Here’s the list of error codes. Here’s what shows after start up. If that’s a coin in error, is there a way to bypass it temporarily? 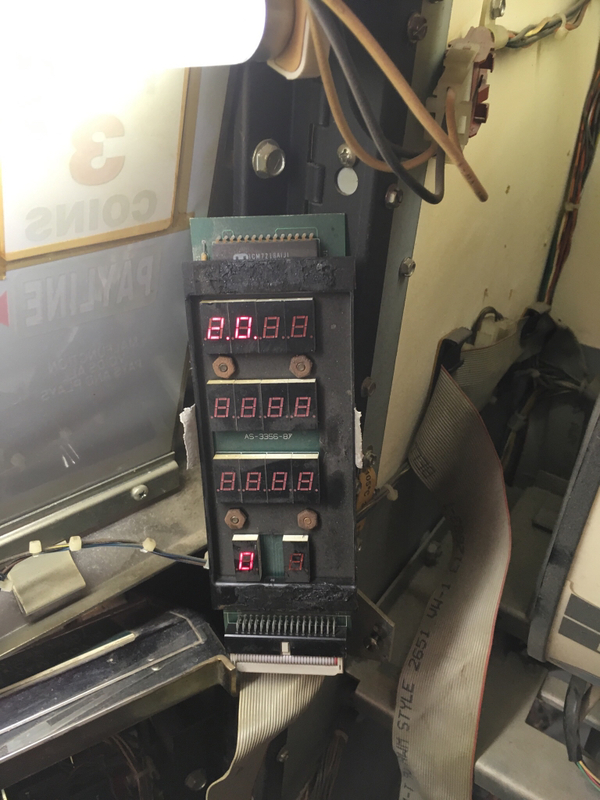 Is looks like someone has messed with the coin acceptor. Here’s a pic. i did a quick search on fleabay for a coin comparitor but don't see anything listed for your 5000.. ya might take a look and see if you see one the right size shape and take a punt on it..
there are several co in the Vagas area that do repairs but that cost monies.. Thanks. 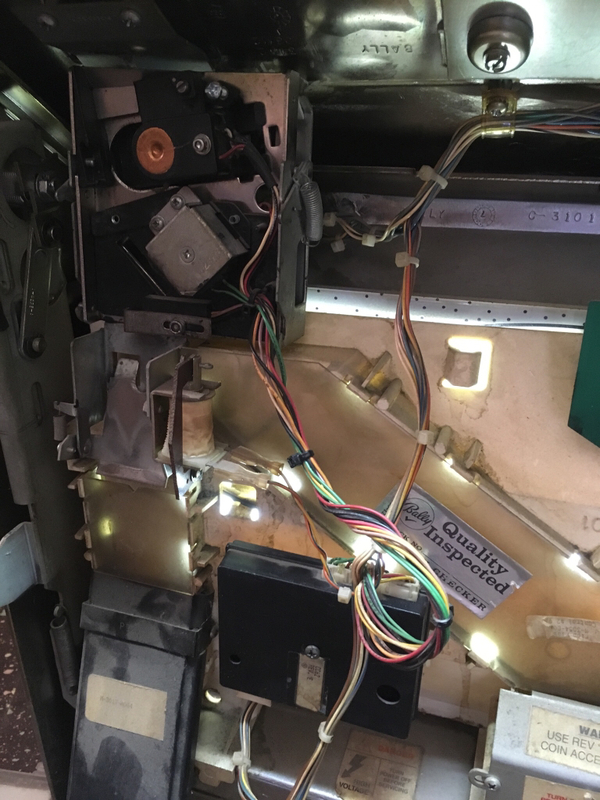 I found a replacement coin acceptor, and fixed the door switch. Now I’m getting an error 31. Payout Jam. It seems to work fine. When I push the button it turns forward and reverse. Any Ideas? does the hopper move at all.. under its own power? It turns after startup. When it’s running through the self tests. The thing is, it only moves backwards, until it goes into error mode. moving backwards seem strange but if it moved forward it would dispense coins.. so its probably correct..
And for my 5000 th. Post . . .